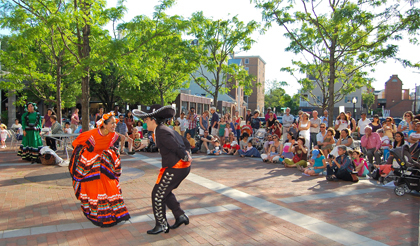 TRIPPING THE LIGHT FANTASTIC SOUTH OF THE BORDER: The Arts Council of Princetons Cinco de Mayo celebration brought Mexican food, music, and folk crafts to Albert Hinds Plaza last week. In a tense, sometimes contentious joint municipal agency budget meeting between Borough Council and Township Committee last week all recommended budgets were passed unanimously, with the exception of that of the Human Services Department, which was passed 4-2 in the Borough and unanimously in the Township. The tension came during a conversation about whether the Borough should divest from Human Services in its entirety. The governing bodies also gave their approvals for capital expenditures, which will include the new pool complex at Community Park. Residents of the Witherspoon-Jackson neighborhood worried that their homes may have been assessed too high in the current revaluation have been meeting to analyze the numbers and determine whether appeals should be filed, with a recent meeting of concerned citizens taking place at the Mt. Pisgah AME Church last Thursday night. This will be a model that we can well be proud of, said Mayor Bernie Miller after Township Committee passed an ordinance amending the residential senior community-2 (RSC-2) overlay zone regulations at its Monday evening meeting. All members of Borough Council and Township Committee granted their unanimous support for an initiative to coordinate public transportation throughout Princeton at a joint meeting between the two municipalities last week. Joe Sandford gets overshadowed at times in his role as senior attacker for the high-powered Princeton High boys lacrosse team. Polly Burlingham wears many hats: Master Gardener, owner of Green Gardens design firm, chairman of the Shade Tree Commission, and now owner of Pollys Pots, a brand new shop in Kingston. A young man recently stopped in at the Princeton Army & Navy store at 14� Witherspoon Street. It was a chilly day, and he quickly walked toward the back of the store, selected a blue hooded sweatshirt, paid for it, put it on, and left!